Help – I’ve found a hedgehog ! We’re pleased to report the People’s Trust for Endangered Species (PTES), in conjunction with the British Hedgehog Preservation Society (BHPS), are launching a campaign to help hedgehogs, and to learn more about their behaviour. 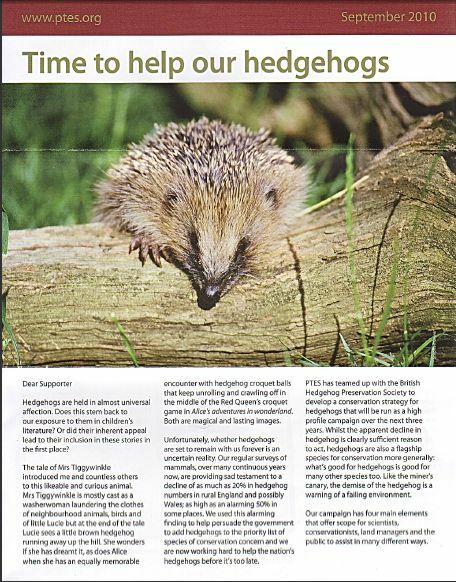 In their September 2010 report, Time To Help Our Hedgehogs, (download here, PDF format, 4.5 MB), they discuss their plans for ambitious projects such as creating a network of hedgehog champions, where hogs will be encouraged into special urban gardens, with the emphasis on allowing free passage. The current concretification of gardens, including concrete-based fencing, is thought to be one of the causes of the decline in hedgehog numbers. They will also be focussing on trying to get to grips with the current hedgehog numbers in England, Scotland and Wales using data from a variety of sources. Additionally they will be looking at the role of agriculture and its impact on hedgehog habitat and behavioural patterns. Finally, they will continue to lobby Government to get hedgehogs added to the endangered species list – currently hedgehogs are afforded recognition as a species in need of conservation and protection, but are not recognised as being endangered, despite surveys showing that their numbers have plummetted by as much as 50% in some parts of the country and pessimistic estimates of a complete extinction of the species by 2020. Do please sign up to the PTES – we’ll keep you posted on here with any developments. This entry was posted in Snuffle Lodge news on October 2, 2010 by clayts.